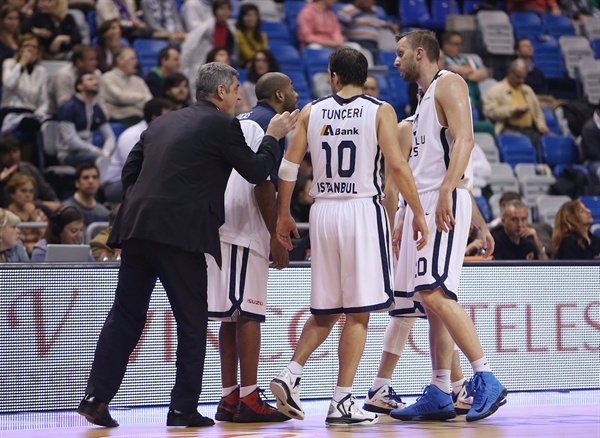 Anadolu Efes Istanbul climbed to second place in Top 16 Group F by edging Unicaja Malaga 73-78 on the road on Friday. Efes improved to 5-1 with its fifth consecutive win, something that hasn't happened since the 2004-05 Euroleague season. 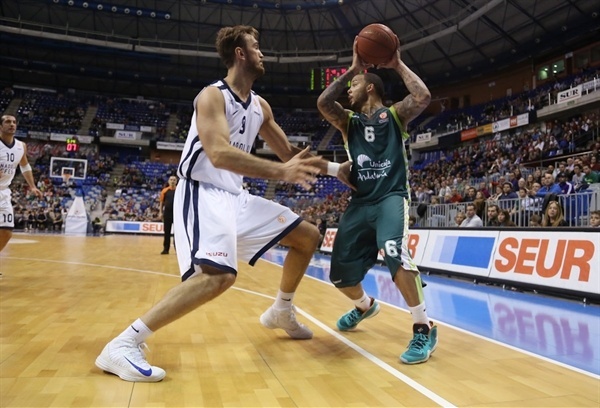 Unicaja dropped to 2-4 and must bounce back right away to improve its playoffs chances. Jordan Farmar paced the winners with 15 points and 5 assists. Kerem Gonlum added 13 points and 10 rebounds while Semih Erden scored 11 for Efes. 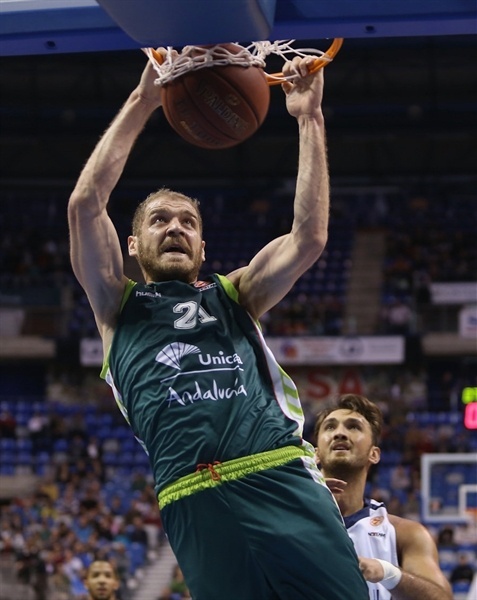 Luka Zoric led Unicaja with 20 points. Marcus Williams and Earl Calloway each added 15 for the hosts. Williams also dished 6 assists. Farmar shined early to help Efes take a 4-10 lead. Unicaja used an 8-0 run to get its first lead, 12-10. Sasha Vujacic had 6 points in a 0-12 run that gave Efes a double-digit lead, 16-26, early in the second quarter. Farmar and Gonlum led Efes as it kept its margin, 28-38, at halftime. A three-pointer by Josh Shipp made it 31-47 soon after the break. 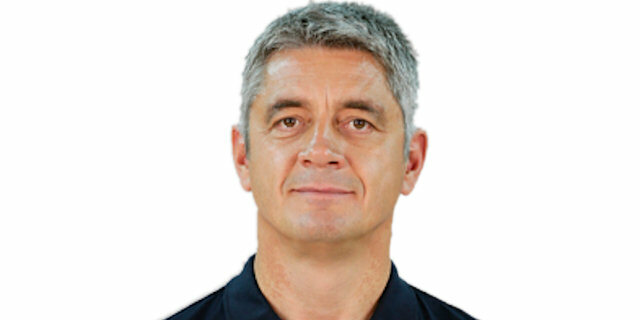 Zoric and Txemi Urtasun brought Unicaja back to life and a jumper by Calloway completed his team's comeback, 66-65, early in the fourth quarter. With the game tied at 66-66, Farmar hit 3 of 4 free throws and downed a three-pointer for a 69-74 Efes lead already in the final minute. A steal by Lucas and free throws by Gonlum sealed the outcome down the stretch. Josh Shipp got Efes going with a three-pointer. Fran Vazquez made free throws, but a put-back layup by Dusko Savanovic restored a 2-5 Efes lead. Unicaja struggled to score early, missing open shots until Zoric ignited the crowd with a dunk. Farmar answered from downtown and a layup by Erden made it a 6-point game. Williams shined with a layup-plus-foul and a triple, as Unicaja tried twin point guards with him and Earl Calloway together on court. 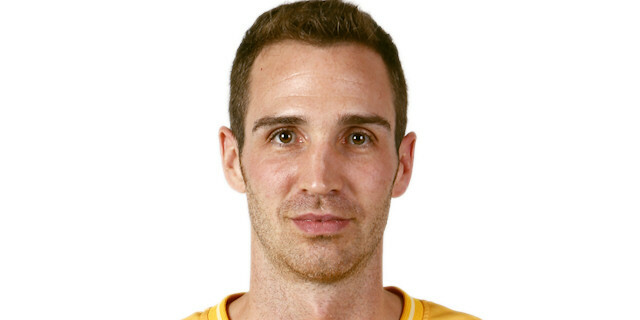 Zoric downed an off-balance shot to give Unicaja its first lead, 12-10, after an 8-0 run. Savanovic and Zoric traded close shots and a long jumper by Farmar tied the game again, 14-14. An unstoppable Zoric scored again, however Stanko Barac matched that with a tip-in. Jamon Lucas nailed a stop-and-pop jumper to put Efes back ahead, 16-18. Sasha Vujacic made free throws and a buzzer-beating baseline jumper by Barac boosted the guests' lead to 16-22 after 10 minutes. Both teams struggled to score early in the second quarter until Vujacic nailed an off-balance, catch-and-shoot jumper. Vujacic soon added free throws to make it a double-digit game, 16-26, after a 0-12 run. Williams buried a six-meter jumper that Erden erased with a one-handed slam, which caused Coach Jasmin Repesa to call timeout at 18-28. Unicaja was limited to just 2 points in over eight minutes as free throws by Erden boosted Efes's lead to 18-30. Krunoslav Simon downed foul shots and Kerem Tunceri's driving layup with a three-point play to give Unicaja some hope at 23-32. Zoric did not miss from the foul line, but Farmar stepped up with a fast break layup for a 25-34 score. Sergi Vidal struck from downtown, Gonlum scored around the basket and followed that with a fast break layup to keep Efes out of trouble, 28-38, as both teams headed back to the locker rooms. Lucas took over with a driving layup immediately after the break and Savanovic scored in the low post to break the game open at 28-42. Calloway hit a triple, but Erden made free throws and Shipp downed his own shot from downtown to boost Efes's lead to 31-47. Txemi Urtasun tried to ignite a comeback with a three-pointer and free throws by Andy Panko got Unicaja a bit closer, 36-47. Erden split foul shots, Williams nailed a long jumper and another triple by Urtasun brought Unicaja within single digits. Zoric split free throws, Savanovic scored in penetration and a jumper by Tunceri gave Efes some fresh air at 42-52. Zoric kept pushing the hosts with a dunk and free throws by Calloway got the crowd involved. 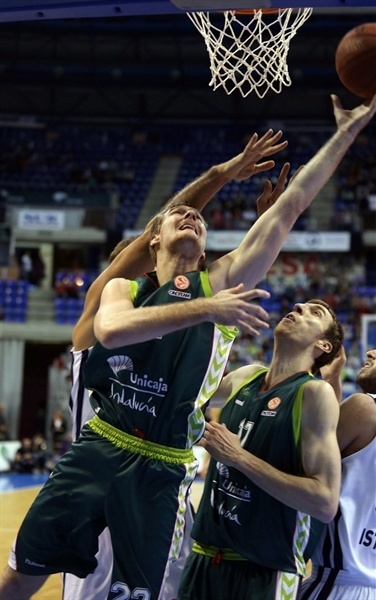 Zoric shined with a three-point play that capped a 7-0 Unicaja run. Gonlum stepped up with a tip-in and split foul shots, before Zoric buried a turnaround jumper. 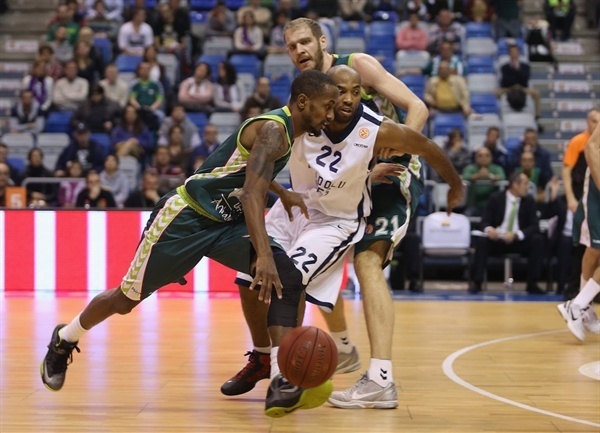 A buzzer-beating triple by Williams brought Unicaja within 54-55 through three quarters. A second-chance jumper by Calloway completed the hosts' outstanding comeback, 56-55, early in the fourth quarter. Efes tried a more aggressive lineup with Lucas, Farmar and Vujacic together on court, trying to play more physical at both ends. Gonlum scored around the basket but a mid-range jumper by Vazquez put Unicaja back ahead, 58-57. Farmar banked in an off-balance shot and Unicaja entered the foul penalty with under six minutes left. Shipp made free throws, but Calloway followed a three-pointer with a running jumper to cause Efes to call timeout at 63-62. Lucas scored in penetration only to see Urtasun bury a big triple off the dribble. Erden shined with a power basket for a 66-66 tie with more than three minutes to go. 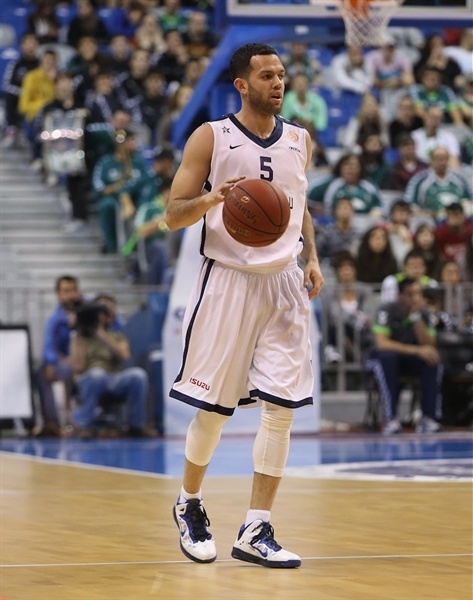 Farmar made free throws and a six-meter jumper by Gonlum gave Efes a 66-70 edge. Calloway swished another triple, but Farmar split free throws and added a three-pointer that touched the rim, went up and rattled in. Still Zoric hit free throws and Unicaja got the ball back at 71-74 with 25.8 seconds left. However Shipp collected a key steal and Vujacic tipped in his missed layup to seal the outcome and allow Efes to celebrate a pivotal road win. "Our first half was frustrating, but I wanted to prove something and those players that did not play well in the first half started for us in the second half. They showed what they are able to do because they proved it, those very same players. I believe in my players. I know what pressure means, but some of them don't." "Other than in the third quarter, we managed to control the game by being creative on offense. We allowed them to run the break, which was our mistake. It was a balanced game in the end, but we played the right way in the fourth quarter and managed to get the win against a great opponent." 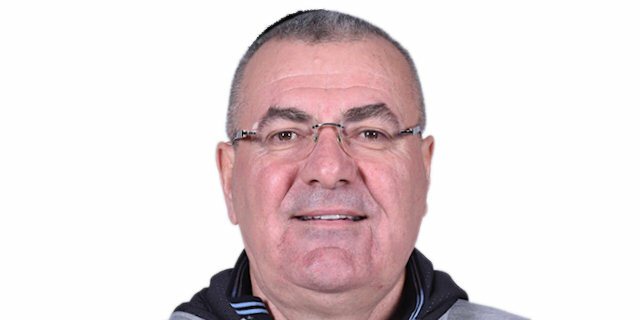 "Efes managed to take an important lead in the first half and extend it to 16 points right after that. We played well from that moment and managed to come back, but Efes has a lot of talent and was better than us in crunch time. We have to carry on fighting in the Euroleague, because we still can still make it to the playoffs."